Want to catch and reuse the rainwater before it goes to waste? Let us help you design and install the perfect Rainwater Harvesting System and Tank for your needs before the next storm hits. 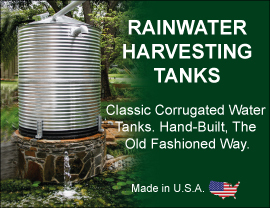 These custom made tanks are perfect for collecting and harvesting rainwater for watering plants, gardens and lawns. We have also designed a unique oval shape which allows for placement in tight spaces, underneath house eaves, or against walls and fences. • Beautiful Classic Corrugated Look & Design. • Heavy Duty Corrugated Galvanized Construction (Also Available In Stainless Steel). • Designed to sit up against Walls and Fences. • 16" Threaded Manway with 4" PVC Inlet Port & Rainwater Strainer Basket. • Standard Fittings: 3" FPT Overflow, 2" FPT Outlet, 1" FPT Outlet. • Holds Approx. 700 Gallons, Custom Sizes Available Upon Request. Tanks are In-Stock and ready for immediate shipment. Available for Local Pick-Up in Windsor. Delivery Available.